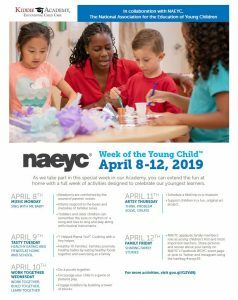 The Week of the Young Child (WOYC) runs April 8-12 and Kiddie Academy locations nationwide are observing it with a variety of fun and educational activities that will highlight music, healthy eating, cooperation, creativity and social skills. Week of the Young Child™ is an annual celebration established in 1971 by the National Association for the Education of Young Children (NAEYC). NAEYC is a professional organization that promotes high-quality early learning for all children. 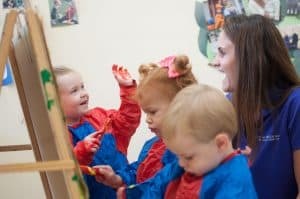 This national event recognizes the importance of early childhood education and programs by focusing public attention on the needs of young children and their families. Get the week started off right by moving and grooving to favorite tunes. Music helps children develop math, language and literacy skills, so turn up the volume to shake and sing the day away! Cooking together can teach kids skills in math, literacy and science as well as good nutrition. Teaching children good eating and activity habits can encourage healthy behaviors that will last them for life. When children learn to work together, they develop their social and early literacy skills. They come together to use their imaginations and give a whole new meaning to teamwork. Roll up those sleeves! On Thursday, we’ll celebrate the fun of getting messy as our students explore open-ended creative crafts– paint, crayons, glue and more included! Parents and other family members are your child’s first teachers. In addition to parents, encourage grandparents and extended family to volunteer in the classroom. Create opportunities at home to share the lessons you learned in your child’s class. Don’t let the fun stop at the Academy doors. NAEYC also has suggestions on things you can do to celebrate at home and share the fun on social media. Contact your local Kiddie Academy to find out more about what they have planned for Week of the Young Child. As we prepare for the upcoming week, celebrate your time with the little ones around you. WOYC 19 is an excellent opportunity to learn more about how we can work together as educators and families to meet the needs of young children now and in the future.